Follow these steps in order to see if your dealership website will be affected. Now we have to see if there are any errors or in this case, how many errors are happening in the background. You will need access to your website’s Google Webmaster Tools. Before we start, log into to Webmaster Tools and select your website. So even though the website above passed the “Mobile Check” you can see there’s a mess of errors going on. Not good. Last we’ll check the “Fetch as Google”. 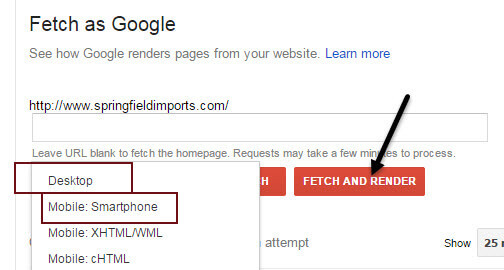 Important: Leave the url field empty, click Fetch and Render one time for “Desktop” and one time for “Mobile”. So in total you’ll run the test two times. Each test takes about 60 seconds to complete. Redirected usually means the website is using a stand-alone app rather than responsive mobile code to display the website on a mobile device. Here’s an easy way to know: Look at the website on a desktop computer > then on a mobile phone. They won’t look the same and the mobile version looks more like an app you’d download rather than a regular website. The url structures of the desktop version and mobile version aren’t the same. While on your desktop site, email yourself a link to a few pages like an SRP page and a few off pages like About Us, then go to your mobile phone and click on them. 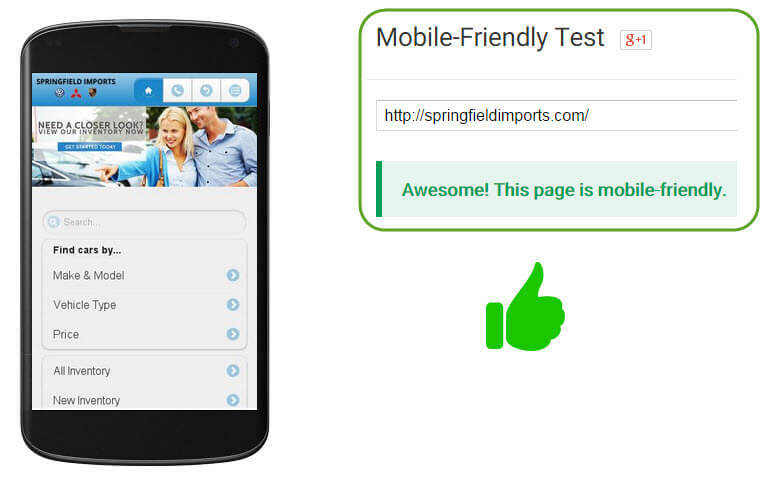 I haven’t tested this lately but just a few months ago doing that would take me to a 404 dead page on my mobile phone for many dealer websites that utilized this mobile strategy. It may not happen on all redirected mobile version websites, but many it does happen and Google knows this. This is also what’s causing a lot of the issues in the “Mobile Usability” and “Blocked Resources” in the sections above. “Partial” means Google was blocked from accessing resources on the website. To see what was blocked, click on the word “Desktop” and you’ll see. WTH are “Blocked Resources” and why doesn’t my dealer website company fix these issues? I’ll try to answer best I can but there are many reasons and some may be intentional by the website company to help keep the website secure. Short Answer: Google wants access to every piece of code the website generates. When access to these resources is denied, it tells you in Webmaster tools in the form of an error. The real answer: Only your dealer website provider knows and it would be best to ask them. More than likely they’ll tell you its for security reasons, whether that’s true or accurate only they know because every website platform is setup differently. I’m confused, so when should I be concerned enough to call and yell at my website provider? When you have a lot of errors like I displayed in this example. More than likely they are already aware of the issues. It’s all about cost per VDP > showroom > sale. If the end result doesn’t occur, where is the breakdown? What it doesn’t do: Replace any Autotrader. It should replace traditional SEM spend. Expensive? Compared to what if they’re not tracking Cost per VDP now?